MYO Ranch-Style Beans - Zesty! MYO Ranch-Style Beans – Zesty! RancherMan & I love ranch-style beans. I’m told that although these beans are on almost every grocery store shelf down here in the south, it’s somewhat harder to find in the more northern states. So in case you’re not familiar with them, ranch-style beans are just beans but they’re different – zestier & spicier and we love them! Recently I was making my weekly endless soup and I decided I wanted something with a Mexican flair. I wanted to include more intense spices, maybe make it into something like a taco soup. So when I started planning what I would mix into my soup I thought how wonderful it would be if we had a can of ranch-style beans to stir in. That would be perfect. But alas none could be found in our pantry. I wondered if you could make your own ranch-style beans. So I hit the internet and read somewhere that it’s basically just pinto beans simmered in a chili sauce. OK, I can do that! I always have dried beans in my pantry, it’s a staple at the Taylor household. I like to cook from scratch whenever possible & although I always have a package of raw pintos for making one of our favorite meals of beans & rice with cornbread, I’ve never really tried to do anything else with them. Since I like to use the cook-once-eat-twice method where you cook large quantities of an entree at one time & freeze the rest for quicker meals later, I brought out an entire 32-oz bag of dried pintos. Then I sorted through them, washed them & put them aside. I didn’t have time for the overnight soak that I usually do with the beans so I just put the washed beans in my slow cooker, thawed some broth from the freezer and brought out chili ingredients – onions, garlic, chili powder, cumin, etc. I chopped the onions, minced the garlic and threw in about 1/3 cup chili powder, some chopped dried peppers for a little extra zing, sprinkled in the other seasons and covered the beans with broth. I turned the slow cooker on high and hoped for the best. With such a large slow cooker it took quite a while before I could get it hot enough to simmer, But when the beans were finally done I gave them a taste and was very satisfied that I had yet again found a way to make something for my family instead of buying it. And since I made the full bag of pintos into ranch-style beans it made a LOT! I used those beans in our soup and they were perfect for the taco soup taste I was after. They were also used as a side dish with supper another night. We loved them that way as well, topped with a couple of thin jalapeno slices. 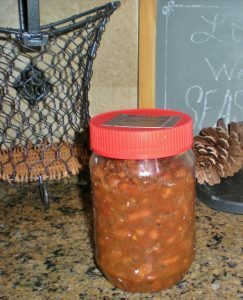 I was able to portion out the rest of this huge pot of beans into small plastic peanut-butter jars (my go-to freezer storage option) and with a quick label on the top, into the freezer they went for delicious ranch-style beans for other meals. Love it! 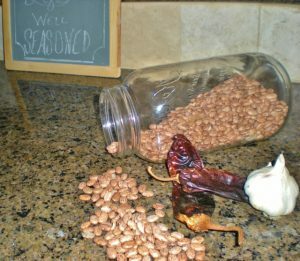 Now I originally found the base for my ranch-style bean recipe at HomeSickTexan. But of course I changed the ingredients to both suit our tastes as well as use what we typically have in our pantry. The original recipe also called for pre-cooking and pureeing the veggies but I didn’t do any of that. I just mixed it all in & got it to cooking. I think the beans turned out absolutely delicious, give ’em a try! The recipe below takes a large slow cooker and a full, honkin’ 32-oz bag of beans. So feel free to scale it down if you have a smaller bag of beans or a smaller slow cooker. Of course they can also be simmered in a stock pot, just be sure to stir them often. Sort and wash dried beans, then cover in water & soak overnight. The next morning drain & rinse beans and add chili powder, chopped dried pepper, garlic, onion, diced tomatoes, brown sugar, vinegar, cumin, paprika, oregano & broth. Stir it all together to blend & place the lid on your slow cooker and turn on high. My large slow cooker of beans cooked in about 9-10 hours. A smaller slow cooker would probably take less time. This entry was posted in Blog Posts and tagged Cooking, Environment, Frugality, Make-It-Yourself, Recipes on February 7, 2014 by Texas Homesteader. I love beans! Thanks for sharing on the What’s for Dinner link up! This looks like it would be delicious. I love using beans. Thanks for sharing on the #WasteLessWednesday Blog Hop! Tammy, for some reason I’ve never made my ranch beans (or any dried beans) in the slow cooker. You have inspired me! I’m emailing this post to myself to remind me to pick up a 2-pound bag of beans. And I love cooking a lot of food and making freezer meals. But again, for some reason I’ve never frozen my beans. I’m going to have fun with this! These sound so good. I can’t wait to try them with some cornbread and greens! What kind of dried chilies? Would crushed red pepper work? These beans look amazing!! I love the spice!! My husband would love them too! Thanks for Sharing on My 2 Favorite Things on Thursday!! Hope to see you again tomorrow!! Pinned! I have seen ranch style beans on our shelves, but never really thought much of them. Now I’m thinking we’re going to have to try them! And I have plenty of pinto beans on hand, so this should be easy to do. Thank you so much for this great recipe! I’ve made it countless times, usually adding a chopped red pepper and crushed tomatoes in place of the diced tomatoes since one person in my house doesn’t like tomatoes. It still works beautifully. I freeze jars of these beans similarly to the way you do, and we plow through them in no time. I love recipes like this one that taste better than store-bought, and save me money in the process! 🙂 Birds of a feather, eh?? I always have jars of these beans in our freezer for quick thaw-n-eat sides and they make a great add-in ingredients for several different casseroles too. Thanks for your sweet comment! Is the broth used a beef broth or a chicken broth? Or does it matter? I am really excited to try this recipe. Thanks for the tips and the recipe. The beans turned out great but they took a long time to soften even though I soaked them over night. I will plan on a longer cook time next time around. Thank you for sharing your recipe! This one will fit into our vegan diet quite well. Woo Hoo! Yummy Thanks for Linking up to the Home Matters Linky party! Growing up in Illinois, I had never heard of, or tried, ranch style beans until we moved to Texas. I can’t wait to give your recipe a try! Thanks for sharing at Merry Monday! Just found this in your Top Posts post hee hee … Have got to try this! I usually cook extra beans and freeze for future use. Having dried beans on hand is a definite must ! 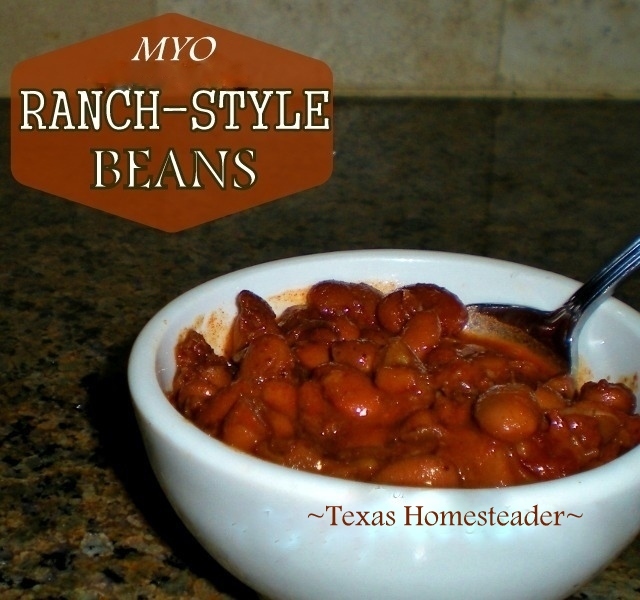 Ranch Style Beans being a favorite of ours but one of the more expensive — so I’m happy to find your MYO ! I will be trying these for sure! I’ll share the results too! Haha! I can’t stick to a recipe either! I’m going to definitely give these a try . I also wanted to say thanks for the tip on the plastic jars for freezing. I have used glass for onions and peppers and mushrooms– I freeze individually on a cookie sheet then pop them in there. Makes for easy removal when the time comes. Hadn’t thought of using the plastic in the freezer — I reuse them but mainly in the shed- or crafting with the Littles. Going to use these in the freezer now! Yum, those look delicious! Thanks for submitting it to the HomeAcre hop! Feel free to stop by Thurs AM and submit another. These look incredible! Thank you so much for linking up at Tasty Tuesday! Your recipe has been pinned to the Tasty Tuesday Pinterest board! Please join us again next week! We love baked beans although I have never made them totally from scratch. Will have to give them a try because they sound delicious. We do love to smoke pork butts and then we freeze the left overs and add them to our beans. It is so good! Thanks for sharing with the Four Seasons blog Hop. I am always looking for new ways to use beans. I am going to try this recipe. Do you know if these can be canned and the directions? I love beans, especially when they’re spicy. This sounds delicious. Thanks for linking to the In and Out of the Kitchen Link Party. Hope to see you next week. I MUST give this a try, it looks delish! Stopping by as co-host of Homemade link Party.